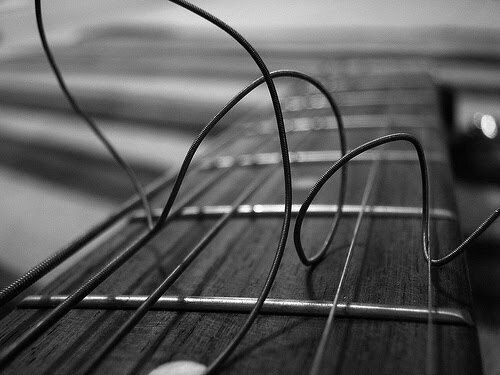 I am a guitar string, wound tightly, and every moment seems to wind tighter. The slightest strumming may cause me to snap apart, violently. I woke up this morning from a disturbing nightmare, and it has had me off-kilter, out of sorts all day long. I have this coarse, heightened emotion bubbling just under the surface, ready to break out at any moment. Not only am I tired from waking up far too early, but I have this angst within me. This ache, a rubbed raw soul, has darkened my day, filtered the way I see, feel. And then the anger simmers underneath it all. That blackness that distorts the world. The enemy of my soul knows it. He has been poking at the open wound all day long, seeking to cause me additional pain. The father of lies continues to whisper to me about the deceptions of others, manipulating me, inciting fear. He has found a crack, a sliver-wide opening into the dark corners of my fearful heart, and he is taking full advantage. He is twisting truth, knotting up the cords of faith, causing discord. This is the subtle, evil ways of the enemy. He finds the easy way in, slinking through the gap in the armor, and begins to infect what he touches. Weakens what was thought to be strong. This is why I need to arm myself with the sword of the Spirit, the Word of the Lord, and the shield of faith. I know that putting on the armor of God will help defend my soul against this attack, this bludgeoning of my heart. I couldn’t fight for myself. Only the One who has fought and won the battle can fight for me, because he has already won me. God whispered to my heart, and I took shelter in His arms. I gave the battle to Him, and He took it on. And revealed to me the fear that is deep, and dark within my soul. A fear of abandonment. A fear of being alone. A fear that I have harbored in the corners of my heart, tucked away, for years. Fear of being found unworthy by those around me. And then, unworthy of God Himself. Because how could He, in His perfection, love someone like me? How could I be worthy of such love, such deep love, love that died upon a cross? A love that stretches out nail-scarred hands to embrace me. A love that laid down His life for the redemption of my soul. This is what He whispered to me, filled my heart with. That He loves me anyway. That He seeks me, finds me, and finds me worthy. Not for anything that I have done. Or haven’t done. But finds me worthy through what He has done, what He has offered to me. His perfect love drives out fear (1 John 4:18). It casts out the trepidation, tamps down the terror, crushes the head of the enemy.